I decided to sign myself up for a beginner’s class with a friend almost 2 years ago, as we were both curious about trying something new and wanted to find a fun and active way to spend time together. In the past I’ve really struggled to find consistency with my exercise, so it’s really nice to have discovered something that I enjoy so much and that keeps me fit at the same time. 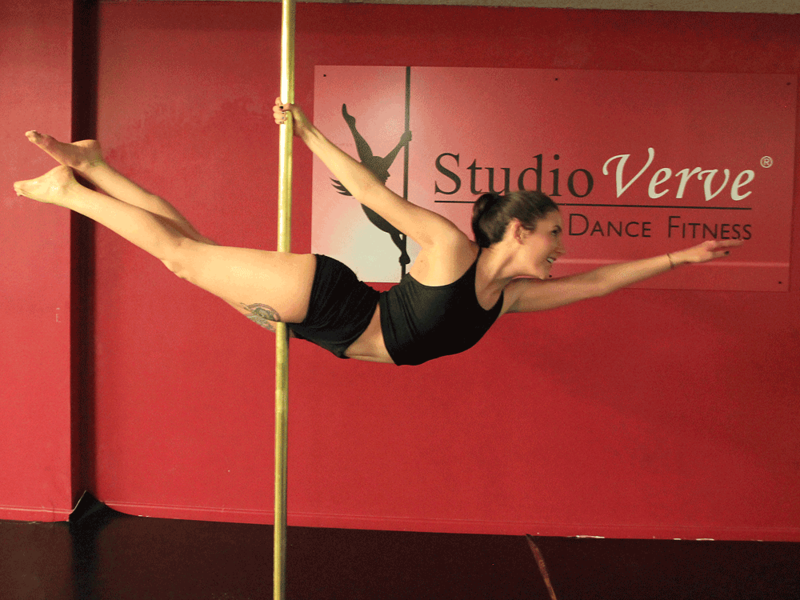 Pole is a great focus for me outside of a pretty demanding job, so it’s been really great to use it as a work-life balance tool, and to have time during the week where I can just concentrate on something that I enjoy. I’ve never been a very athletic person, so when I show my friends and family videos of the combos I’ve learnt in pole, there are always shocked comments about how graceful, strong and coordinated I look. I take it as a compliment, even if it implies I’m not like that in real life! I’m trying to focus on my flexibility this term, and whilst I know the splits are still a fair way off for me, I’m working on it slowly! So my goal is to spend a bit more of my free time practicing and stretching so that I’ll be able to nail the moves that require more flexibility in the advanced levels. As long as my body will allow me! I love that it’s focused on fitness and has a really inclusive and friendly atmosphere – I’m always genuinely thrilled when one of my classmates reaches a goal and I’m there to see it, and it’s really great to get the same encouragement from them when I’m struggling with something. I love that it’s an all-body workout, and that you can really see changes and improvements quickly. It’s very rewarding to see the work pay off! It can be painful at times (learning the inside leg is a period in my life I won’t easily forget …) and there are a lot of scary moves, so overcoming the pain and the fear can sometimes be a challenge when you’re first learning something. I’m a strong believer that anyone can benefit from pole dancing! When I have friends who are inquisitive about it but worried they’re not fit enough or a certain size, I’m quick to tell them that there are no limitations when it comes to pole, and that the most unlikely people can be amazingly skilled pole dancers.